Measures static charges instantly, reliably, economically! Reliable on-the-spot measurement of static charges has never been easier than with the portable Model A-300B. Hand-held, yet highly accurate, the A-300B answers three basic questions: 1) Is static present and on what surfaces, materials or people? 2) How much static? 3) What is the polarity of the charge? The instrument is ideal for use on such static sensitive environments as electronic component production and assembly areas, clean rooms, computer, medical and R&D laboratories, surgical rooms, medical device manufacturers, printing presses, packaging and production lines, etc. No auxiliary attenuators or heads are required; the A-300B is completely self contained. To minimize error from extraneous state fields, the unit utilizes a recessed nicked-plated sensing electrode, which operates on a high/low circuit. The low range measures 0-500 volts at 0.5" to the surface being measured and 0-3000 volts at 4". The high range measures 0-5000 volts at a distance of 0.5" and 0-30000 volts at 4". 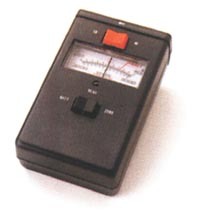 For repetitive measurement, the A-300B features a unique "quick zero" function which instantly re-zeroes the instrument and provides ground compensation for the user. Size 4-3/8" x 2-2/8" x 1-5/16"
The target must be large relative to he sensitive electrode. For total accuracy, the target be tested must be 2" x 2" or larger at he 1" range. At the 4" read range, the target must be a minimum of 16" x 16". Smaller target will result in inaccurate readings. LO range is read directly from meter. HI range is 10 times meter reading. If general magnitude of charge is unknown, start in LO Range. Discharge you body by touching a grounded metal object, e.g., water pipe, metal electrical conduit, grounded machinery or workbench. Face the instrument away from charged object, press the black ZERO switch twice, then release. Switch will return to READ position. The instrument may also be zeroed by pointing it toward a known grounded surface and pressing the ZERO switch twice. Point electrode toward target and move to a separation of either 4" or 1". Note reading on appropriate meter scale. Repeat 1 through 4 for additional measurements. Return RED switch to mid-position to turn instrument OFF when not in use. The unit uses a 9V transistor battery. Replace battery on low indication in battery test. Replace battery when storing instrument for an extended period of time. If excessive drift is noted, the surface of the electrode may require cleaning. Wipe the surface of the electrode with a soft cloth saturated with clean alcohol and allow to dry thoroughly. Dust off any lint.